A total knee replacement surgery has become among the most common operations in the United States. However, despite the vast number of total knee replacement surgeries performed each year, success and failure still depends on whether a surgeon can get a proper fit for the artificial knee device, according to a recent article from ABC News. However, a new surgical device being used in U.S. hospitals is helping doctors get a more precise fit for artificial knee implants. The new device is known as Verasense. It is one component of the system that is designed to help orthopedic surgeons while preforming total knee replacement surgery. 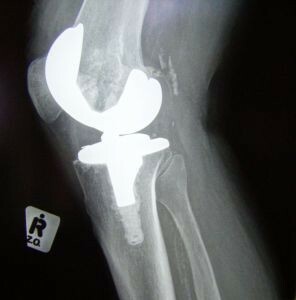 The first thing an orthopedic surgeon will do after removing the deteriorated natural knee joint is to is to insert the Verasense into the patient. This new medical device will sit in the position where the final implant device will be placed and take sensor readings of the operation site. The device will then transmit its results to a computer, which will tell the surgeon where to remove bone and tissue or where to build up bone tissue to get as close to a perfect fit as possible with the artificial knee joint. If the device fits too loose, the doctor can take space away by placing artificial caps on the patient’s leg bones. These caps vary in thickness and will depend on what the machine tells the doctor to do. Before this device was available, surgeons could use a cutting guide similar to a carpenter’s jig and approximate the space as best as possible. According to device manufacturers, the new medical device will allow for a much more precise fit. This will significantly decrease the chance an artificial knee will fail, because unintended movement is one of the main causes of medical device failure. One patient who volunteered to participate in the news feature was a former surfer who wanted to be able to surf again. He already had one knee replaced using traditional methods and was to going to have his other knee replaced using the new medical device. Following his surgery, he was actually able to stand and take a couple of steps, which is pretty remarkable on the same day as a total knee replacement operation. This device is not made for any specific artificial knee and is compatible with most models that are already on the market. While this is a step in the right direction, as our Boston knee replacement injury attorneys have seen, it does not matter how good the fit is or how skilled the surgeon is if the artificial knee device itself is defectively designed. The vast majority of these artificial knee implant devices were designed to last for at least a decade if not 15 to 20 years. If you have recently had an artificial knee replacement and are experiencing pain or suffering, you should speak to your doctor as soon as possible. If you are told you will require a second surgery to replace the defective knee, you should contact an experienced products liability attorney, because you may have a valid claim against the manufacturer.